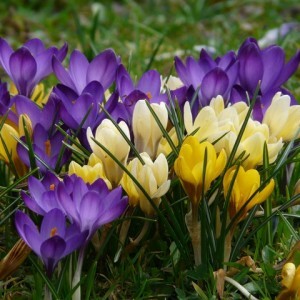 Crocus is the small ornamental plant pleasing with the blossoming in the early spring, or late fall. The name was received for similarity of the dried-up columns with fibers, threads («kroke» - in translation from Greek «thread»). A saffron (in translation yellow)got its name because of the yellow columns of a pestle. Land crocuses in August–September, during this period crocuses stay at rest. If poor soil it is desirable to bring the rerotting manure in it (it is impossible to bring fresh). The best time for landing - the beginning of September - for the vesennetsvetushchikh and the beginning of August – for the osennetsvetushchikh of grades. Crocus. Crocus cultivation. Crocus flower.